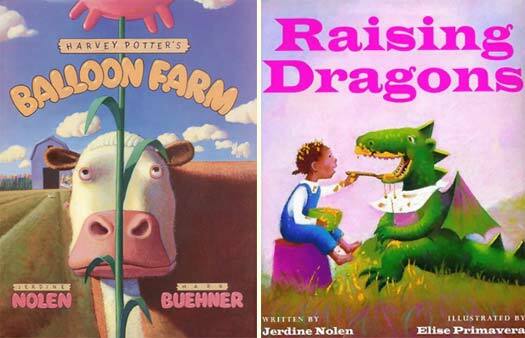 Award-winning author Jerdine Nolen‘s picture books often tell stories that blend fantasy and realism in an unsettling way that delights young readers and fires their imaginations, from her first book Harvey Potter’s Balloon Farm, which was made into a ‘Wonderful World of Disney’ television film, right up to her latest story, Irene’s Wish. Her book In My Momma’s Kitchen, on the other hand, is inspired by her own childhood; and her powerful chapter-book Eliza’s Freedom Road chronicles a young slave’s escape to freedom in 1854, from Virginia all the way to Canada, helped on her way by the stories her mother had told her and the symbols on the quilt she had left her. Chicago, Illinois, along with five sisters and two brothers. She lives in Ellicott City, Maryland with her family. Welcome, Jerdine. 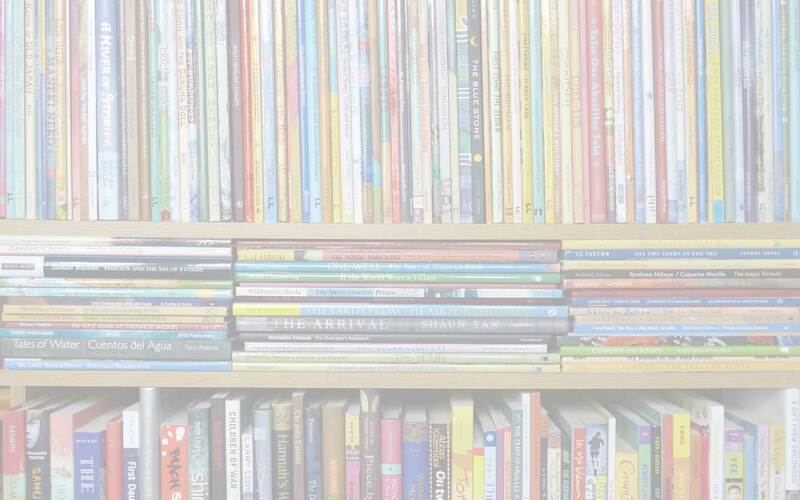 In an interview with The Brown Bookshelf in 2010, you talked about how you literally collected words in a box as a child. I love that! When did you start putting those words together into stories? Do you still file away words (literally or figuratively) to use at a later date? I don’t think there was a distinction between these events. As I got older I made up other kinds of word games. One of my favourites was what I called The Dictionary Word game. We had a gigantic dictionary in our home. It was very heavy and had to have its own stand and everything. I would close the book and my eyes, concentrate, then open the book to any page, and plop my finger down. Whatever word my finger landed on had to be put into the first sentence or paragraph of the story I was writing. At the time, collecting words and my Dictionary Game were just games I played. I had no idea they were also teaching me to become a writer. Many of your stories contain a magical ingredient. It’s all presented very matter-of-factly but certainly in your latest picture book Irene’s Wish, it is also slightly disturbing – would you agree, or maybe that’s just from an adult perspective? Yes, there is often some kind of paranormal gift/activity in my work. Irene’s father has a “magic growing touch”. I think fairy tales and tales for the young have something magical, scary, and soothing in them. When I think of the fairy tales and stories I read as a young one (Hansel and Gretel, Cinderella, Snow White), they were quite disturbing. And when we look at stories from our generations – Where the Wild Things Are, Outside, Over There, to name a few – there are things in them that are scary then ultimately make the child feel safe when things are made right in the end. I think it helps the child realize they live in a safe world, problems can be solved and the world can be put right again. Irene’s Wish is, as I mentioned above, an extraordinary story. It certainly begs the question, be careful what you wish for! Where did your ideas for Irene’s Wish come from? What was it about Papa turning into a tree that appealed to you? Thank you. I love the story. The idea came out of my childhood. My father, who was not the sort of “sit on the floor and play with us” kind of dad, loved trees, any kind of tree, all kinds of trees. On the one hand he loved them for their beauty and their usefulness, he was raised on a farm, so growing things out of the Earth was important to him. Though he was not a farmer, he loved growing things. I think Irene’s Wish was an inside joke for him – too bad I could not show him how it all turned out. Like everybody else my age, I was an active child. I loved to run and chase and just play. Now, imagine me wanting to play Hide and Seek or Tick, Tock, I’m a little Cuckoo Clock with my father (because when he lifted you up, you felt as if you could touch one of the clouds). In those days, Father was very tall, at least 6′ 2″. Mostly, as it appeared to me, he only wanted to point and look and discuss the beauties and joys of trees. Now also imagine me with my magic wand feeling a bit irritated that he did not want to play a game with me. The solution was easy. I knew how to work a magic wand. I went into the pantry. Closed the pantry door and recited my incantation: Since you love trees so much, you shall be a tree! Ding! Bling!! It was an easy and just solution, at the time, but did not manifest itself until many years later in the pages of a book. I know how real life works! We live in the real world. You may be able fly high getting lost in wonderment, for a while, but gravity is a real force. Even birds succumb to it. I like that Irene’s father gives her a practical advice: “Get ready to live with the thing you wished for.” It’s no different than the farmer who makes a wish by planting a seed in the ground. He has to get ready for the harvest. Obviously, the things we do require thought. But I like this better than saying: be careful what you wish for. The story leaves you wondering if the characters really did experience the events of the narrative, within the reality of the story, or if it was ‘just a dream’, as it were. Do you have a take on that? I think that can be said of many of my stories. When Harvey Potter’s Balloon Farm and Raising Dragons were published, young people constantly asked me if the story really happened – if it was real? “Of course it is,” I said. And then I explained that when I wrote Balloon Farm I was reading and very familiar with Jung and learning about what he said about a parallel universe. I thought a story like that could have happened “somewhere” out there or here one day. It may not be real, now, but all things are possible one day – I believe in impossible possibilities or possible impossibilities. I think my characters experience the narrative as it is written. We, the reader experience the characters. Maybe not in our world but in an imaginary land or the future or you’ll figure it out. We all have to suspend belief in order to read many books or watch a movie/television. What for you do AG Ford’s illustrations add to the story? The relationship between the art and the words of the picture book is high magic! It is supposed to work. When it works, we are all better for it. I love what AG Ford did with the story. I am grateful to him for bringing more life to my story. Have you shared Irene’s Wish with any children yet? If so, what has been their response – and what about the adults in the room? Yes. Often parents are in the room as well. I like to “storytell” my stories. 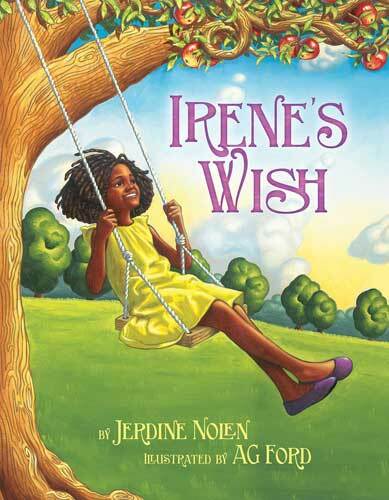 Reading Irene’s Wish has often brought ooos and aahhhs and lots of laughter. Once when I turned to a particular page, someone blurted out, “What? !” That happened to be a parent. All in all, it is great fun. 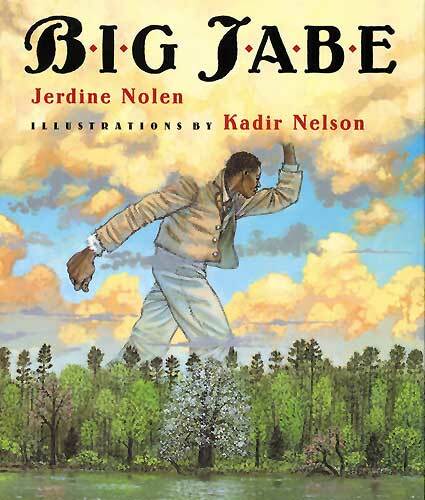 One of your first picture books, Big Jabe, also contains a tree with magic properties – a pear tree planted by Jabe, who had been discovered by a young plantation house slave called Addy, floating down a river in a basket when he was a child. 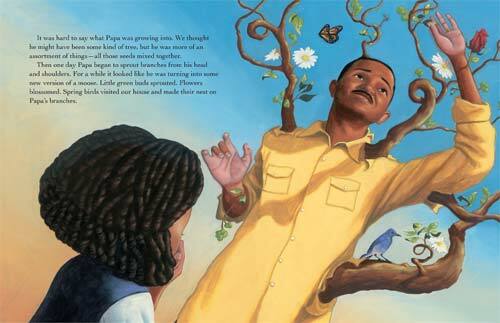 The literally larger-than-life Jabe helps slaves to disappear by taking them to the pear tree… The story is multi-layered and complex and yet told simply enough for young children to distill its essence; and Kadir Nelson’s illustrations are simply stunning: altogether, it’s a beautiful book. I realise you wrote it a while ago now, but in keeping with MWD’s current ‘Trees’ theme, can I just ask you: why a pear tree? There are so many reasons trees show up in my work. I think after reading my other answers you see I come by this through a family tradition. In Harvey Potter’s Balloon Farm, our narrator climbs up to the top of the sycamore tree to get a good look at what was going on when the government came out to inspect Harvey Potter’s balloons. Also, I have been taken with Zora Neal Hurston’s work. I have read Their Eyes Were Watching God, many, many times. The story elements are epic. There is a pear tree in that story and a discussion about bees. It was not an apple tree. Then, in one of the neighbourhoods I lived in were very old Bradford pear trees. The trees do not produce fruit, but in spring they blossomed beautiful white flowers. In spring, the wind would blow the petals off the trees. It is absolutely breathtaking to watch. I was honoured to be present to witness this event. I truly feel inspired by trees and the spirit of trees. They have witnessed so much and do so much caretaking of the air for us. Do you have a favourite tree – in general and/or specifically? I love them all. Sycamore, pine, oak, ash… is hawthorn a tree or a shrub, Christmas, sequoias, to name a few. 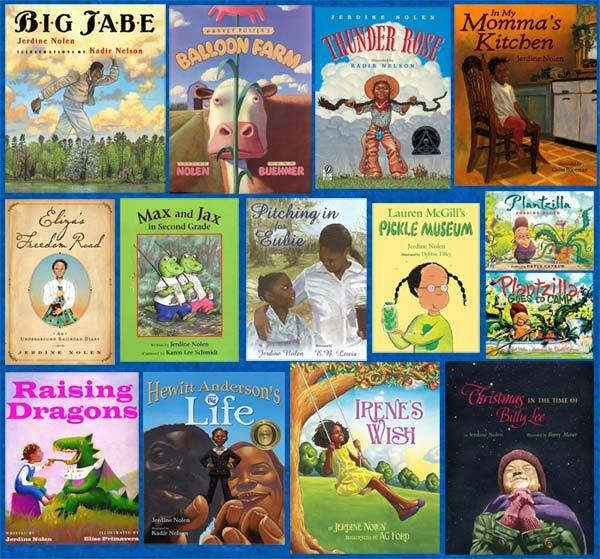 Your stories are great for reading aloud. Do you ‘hear’ your narrative in your head, or do you read aloud while you are writing? It may be both. On some occasions it seems as if the character is channelling through me. I hear their “voice” and write as fast as I can. Because I have lived with the idea for so long, six months to a year, it is a matter of sitting down in a quiet space and just listening. I do act out the story. Yes, the voice and story are real and vivid to me. And, I cannot stop, or sleep, or boil water, or write fast enough until I get it all down. When this happens I lose track of time and space – it is wonderful. I hear it as a whole piece from beginning to end. Who or what have been the greatest influences on your writing? That is hard to say. My parents who were wonderful story tellers. Certainly the people whose work I love; I mentioned Zora Neal Hurston for one. Nina Simone influenced my work – I love to listen to her recordings, not necessarily while I’m working. Language, sounds, words – the stories of old, Grimm, Andersen – I feel fuzzy around the brain trying to answer this. Everything influences me – sunlight, shade, the natural world, trees, my children, when something goes wrong in my life, when things go so well in my life. Maybe that’s it. Life. There’s a lot of humour in your stories, as well as that touch of magic: I especially love the beginning of Thunder Rose, for example, when, as a newborn baby she thanks her parents and tells them she’s ‘right partial to the name Rose’. Does your writing go through many drafts to hone that blend of the matter-of-fact and the ridiculous? Thank you so much. I agree. I love that story. I love the way it begins. I love the way the story wrote itself. It had been percolating for a while. 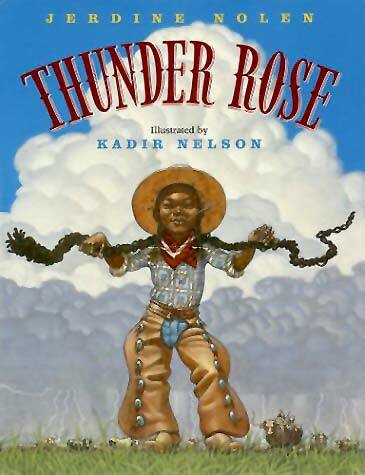 Like many of my stories such as Thunder Rose, the story has lived inside my head for a fairly long time. It’s been working things through and knitting itself together and taking shape inside my head. It is a very real thing to me. Often when this is the case, I have to find a nice pencil, a comfortable chair, and lots of nice paper. I sit and listen, writing as quickly as I can. This is about a two-to-three-hour happenstance. I love when that happens. 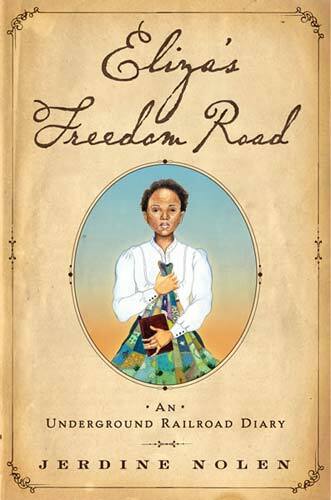 As well as picture books, you have written one middle-grade novel, Eliza’s Freedom Road, the 1854 diary account of a girl’s journey from Virginia to Canada to escape slavery. Apart from the obvious factors of length, how different was the writing process for you, in terms of pouring out the story? Of course, it was totally different. Eliza was supposed to fit into a real place in history. Whatever I could concoct in my head, I had to make sure my facts were correct. That slowed down the process. What did writing Eliza’s Freedom Road mean to you personally? It is important to me that these people are remembered more than by “Slave”. Their sacrifices and their lives are remembered. These were real people who had identities and personalities and intellects. They were treated so terribly and suffered such horrific lives. In many instances, we don’t even know who they were. That is very sad to me. I’m fascinated that you say you were inspired by Chaucer’s Canterbury Tales – can you tell us more about that? There are so many reasons for Eliza’s Freedom Road as a story within a frame as Chaucer did with his Tales. I think it brilliant that Chaucer had such insight into human behaviour to bring such a variety of personalities/pilgrims from such diverse backgrounds together to create a community through story form. I love reading the Canterbury Tales. It is a simple human thing that we do as humans, band together for a common goal – travelling to a place for some specified reason. When my children were young and we’d take a journey by car, we/they usually read, sang, or we told stories to make the journey move faster. This country, like most countries, is made up of millions of such stories. Stories connect us. Stories define us. The world turns on a story. The Slave escape stories reminded me of a pilgrimage, no different than the early British refugees that sparked the creation of the United States. These souls sought religious freedom, to worship, and to live as they saw fit. Slaves sought these same freedoms. When my editor suggested I compile a collection of stories, I felt I wanted to connect the telling of the stories I was writing to some event. It turned out it was an escape from Slavery. Again, because travelling with a group for a particular reason was key, that brought me again to Chaucer. Do you have any other books in the pipe-line? What are you working on at the moment? Yes. I have several projects going at the same time. As far as publication, I have two several Easy-to-Read books coming out, Bradford Street Buddies: Block Party Surprise and Bradford Street Buddies: Camp Out. The publication date is September 1, 2015. Thank you so much, Jerdine. Before you go, can I just put you under the MWD Spotlight? 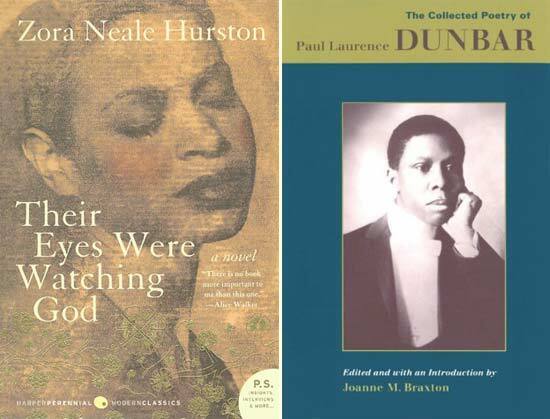 As a young girl, learning/reading about, and then hearing the poetry of Paul Laurence Dunbar, which explained why he wrote in vernacular, brought a new perspective to my life and who I was in the world. My early work – writing during childhood — was poetry. My first work, a poem about Thanksgiving was published in our school newspaper. It was aptly called, “The First Thanksgiving”. And Zora Neal Hurston – my 6th grade teacher read her works to us. Paper. Does this make me old-fashioned? 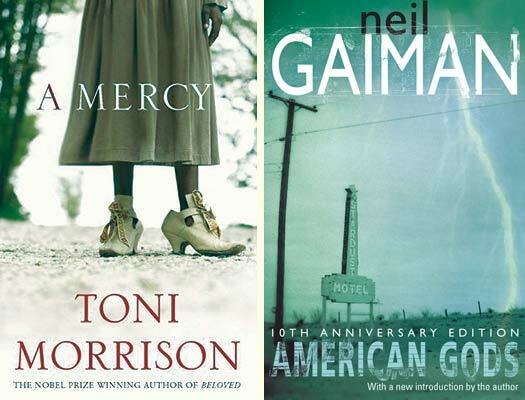 A Mercy by Toni Morrison; and Neil Gaiman’s work, especially American Gods. Lie on a beach, then hike to the mountains, and return to the beach. 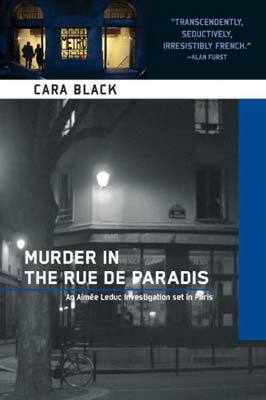 Being a modern woman, such as I am, and running a successful detective agency in Paris such as the Aimée Leduc Investigations, like in Murder in the Rue de Paradis, by Cara Black. I’d like to move to France become a successful detective and live there for as long as I wanted! Fiction/Fantasy for older audiences – children and adult. 'Branching Across the World: Trees in Multicultural Children's Literature, A Mercy, AG Ford, American Gods, Barry Moser, Big Jabe, Cara Black, children's books about trees, Christmas in the Time of Billy Lee, Colin Bootman, David Catrow, E. B. Lewis, Elise Primavera, Eliza's Freedom Road: An Underground Railroad Diary, Harvey Potter's Balloon Farm, Hewitt Anderson's Great Big Life, In My Momma's Kitchen, Irene's Wish, Jerdine Nolen, Kadir Nelson, Karen Lee Schmidt, Lauren McGill's Pickle Museum, Mark Buehner, Max and Jax in Second Grade, Murder in the Rue de Paradis, MWD interview, Neil Gaiman, Paul Laurence Dunbar, Paula Wiseman Books, Pitching in for Eubie, Plantzilla, Plantzilla Goes to Camp, Raising Dragons, Shadra Strickland, Simon & Schuster, Their Eyes Were Watching God, Thunder Rose, Toni Morrison, Zora Neale Hurston. Bookmark. Watch Jerdine talk about Eliza's Freedom Road. 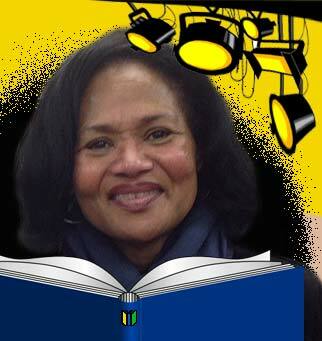 Read Jerdine's interview with The Brown Bookshelf (2010). Read Jerdine's favourite birthday memory plus activities inspired by her 'word banks' and Harvey Potter's Balloon Farm on Eric VanRaepenbusch 's Happy Birthday Author blog. Read more about Jerdine and her books here.